Remember putting on a fashion show with your friends as a kid? Now it’s your kids time to shine! 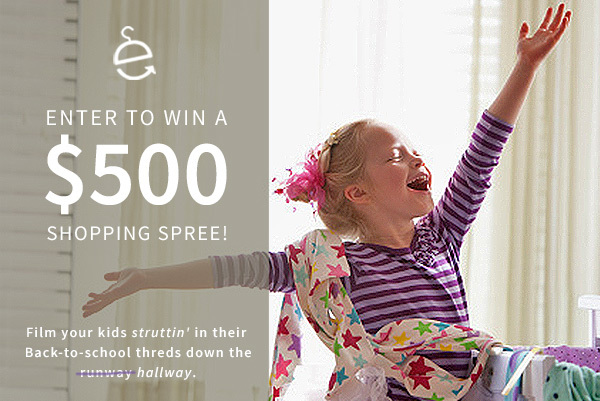 Submit a video of your little ones struttin’ in their favorite back-to-school outfit(s) for a chance to win $500 to thredUP and a possible feature on our site. Using your web cam or mobile device, shoot your “little model(s)” struttin’ down the runway hallway in their favorite back-to-school outfit(s). Make sure your video is 10-15 seconds. You may only enter a video submission once. Last day to enter is August 31st, 11:01PM PST. Public voting will start on August 5th and run through August 31st. You can gain an additional entry for every time you “share” the contest on Facebook, Twitter, or Pinterest. Guidelines for a great video! Please make sure your kid(s) is centered in the frame of the video. Make sure there’s enough light so we can clearly see the star and their outfit. Be sure to keep a steady hand while filming, or place your cam/phone on a sturdy surface. Remember to have fun & strike a pose! Winner will be announced on September 2nd!